Sometime in November or December, Jen Hatmaker tweeted that she was looking for people to read her newest book and blog a review about it. I love reading her blog and her tweets are right up my ally so I jumped at the chance to read this book. "7" was emailed to me just before Christmas but I had to wait till I returned home to download it since I was without internet over the holidays (poor me). 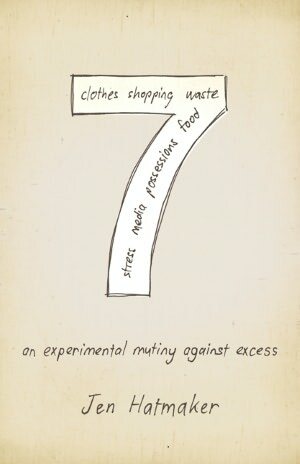 "7: An Experimental Mutiny Against Excess" is just that. It is Jen's story of being faced with the excess that she and her family were living in and taking on the challenge...declaring war on the captors of their hearts. Food, clothes, waste, media, spending, possessions, and stress...these are the captors they fought. When I signed up to read this experiment, I expected some cute antidotes about the trauma of sticking to only 7 foods for a month or learning to recycle. I expected some sweet little tidbits of wisdom that I could add to my collection of Christian-living badges. I got those things, for sure, but I also got what I did not expect: Confrontation. Jen is conversational in her writing so "7" is very easy to read in that sense. As I read at my kitchen table each morning, it was as though Jen was sitting there with me sharing a fresh pot of coffee, only not, since she gave that up for the experiment. I love reading a book when I feel like I know the author afterward. That is what I love about her blog as well, you get to see her heart: the things that she cares about, the way she loves her family and her church and her God. But, you also get to see her personality: witty, passionate, kind, maybe a little crazy. 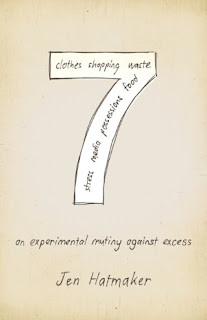 However, in the confrontation realm, "7" was all but easy to read. Now let me be clear, Jen, in NO way pours on the guilt when she is writing. She is simply sharing her story, inviting you to join, but never blaming or trying to act as the agent of conviction. I have this little problem where when my blindness has been healed in an area, I just walk around with my eyes closed like I never saw a thing. It's easier that way. I've figured out how to live blind. What will life be like if I try to live it as a seeing person? Well, before picking up this book, I already had a sense that this year would be one of hard work, hard lessons, and some sweet fruit. I may have even asked the Lord to let me see more of Him. But, as I read about Jen's war on the excess that had enslaved her, I grew increasing more uncomfortable about the coming year. I knew that the stirring in the wind meant that I would actually have to deal with these questions that Jen posed. I would have to do more than read a book about someone else's experience. I was only in chapter 2 when my friend texted me to ask if I wanted to undergo our own 7 war. I told her I didn't know. I was only in chapter 2 for heaven's sake. Then over the weekend, I watched live streams of Passion 2012 and wept in my kitchen as college students gave over 3 million dollars to fight for the end of human trafficking. I decided I probably didn't need to pray about doing something to create space for God to teach me about what He thinks is important. I texted my friend to tell her I was in. And so a little group of us in Houston will be changed. In 2012, we will go to war. We will "experiment" with needing less. We will find freedom from stuff. All because Jen Hatmaker and "7". Because she had the audacity to think that there is something more than filling our houses up with trinkets and clothes and our earth with landfills. Can you believe her? If you are tired of trying to find the "stuff" that will keep you and your family happy, if you know that surely there is more to life than having the right shoes, if you don't have any idea how to live in your state of life while there are orphans and trafficked people then you should read this book. If you have been disillusioned by the church, read this book. If you love the church but want her to reach her potential, read this book. If you like witty writing, read this book. Yep. Do it. READ. THIS. BOOK. It's worth it. The hard questions, they are good. So, we are sevening...yes, I have made seven a verb. I thought about sharing an email I wrote the other girls about my struggles with this, but I decided, it is really irrelavent. You don't need to know. I'm not doing "7" for you. I'm doing it because I want to hear from God. I want to know what Micah 6:8 (do justice, love mercy, walk humbly with your God) looks like in daily life. I want to see beyond the horizon that the mountain of my stuff has formed.